If you have noticed, I haven't posted anything this week-I was one of the several lakh residents of Chennai city affected by the floods this week. Now I am safe n sound. This post shares the developments this week, as I experienced it first hand. 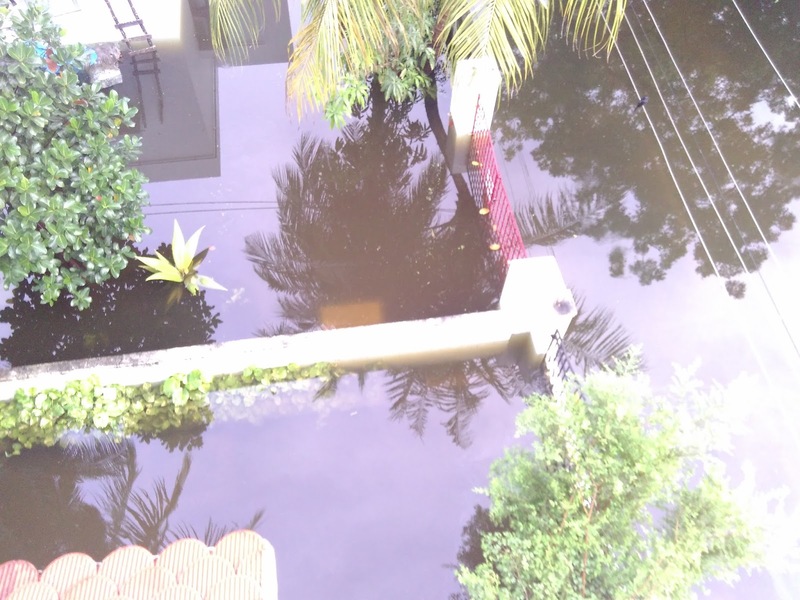 November 2015- Chennai did receive lots and lots of rains, several areas in Chennai got flooded- but our area was relatively unaffected. We had power, water and all other essentials. Towards end of November rains stopped and sunshine returned. Everyone thought the worst is over and city started to return to normalcy. December 1st, 2015, 7 AM: Looked like another normal rainy day. I went to office with my raincoat on. But information started circulating about impending heavy to very heavy rain heading towards Chennai. I could see rain pouring non-stop outside. By noon, I felt that roads might get flooded and I may not be able to go home, so I left early with intention to work from home for rest of the day. December 1st, 2015, 1 PM: Rain continues. BSNL internet stops working. I kept my phone for charging. No major crisis anticipated yet. We were hopeful of rains stopping in a few hours as it usually does. December 1st, 2015, 6 PM: Rain shows no sign of stopping. Power supply cut off. I had about 90%+ charge. We hoped it to be a temporary power cut and expected it to return in about an hour as it usually does. December 1st, 2015, 9 PM: Downpour continues. No sign of stopping. Power doesn't return either. We went to sleep early, hoping things will be normal by morning. December 2nd, 2015, 6 AM: As I woke up, raining was still continuing. Noticed water logging outside, but our house was still 3 steps (about 2 feet) above outside ground level. So it still didn't ring a bell. December 2nd, 2015, 7 AM: Water level was slowly but steadily increasing. First thought that we might face what most other Chennai houses faced- water entering the house and making it unfit for living was now a reality. December 2nd, 2015, 7.26 AM: Water was just about 8-10 cm from our floor. Still increasing steadily and I could see lizards and reptiles of various sizes in water. I published a facebook status update informing everyone of a potential risk. Immediately started preparing ourselves-removed all items on the ground and kept it in racks above, even cleared lower most rack in all rooms. We moved our bikes and cars to an elevated ground in knee deep water before it could get worse. December 2nd, 2015, 10 AM: Water enters our house- not from door as we expected but from bathroom via drainage ducts. Our owners who were staying in above floor were also noticing the developments- they had a spare room which they cleaned up and gave us to stay. We took some essential stuff and shifted upstairs. I went out in water (about waist deep in deepest part), bought some supplies- biscuits, noodles, candles etc. Switched off phone to save battery. Rest of the day we spent indoors staring at the rain and hoping for it to stop. Rain stopped occasionally but would resume relentlessly soon after. I checked on Oyo app if there are any rooms available- it showed a few but I felt those areas are very likely flooded. Called Oyo helpline, they said only few rooms are available but that is in areas like Nungambakkam and Kilpauk which is far from where I was. Wasn't sure if we can get till there and if those places are not flooded. Decided to venture out and figure out myself. 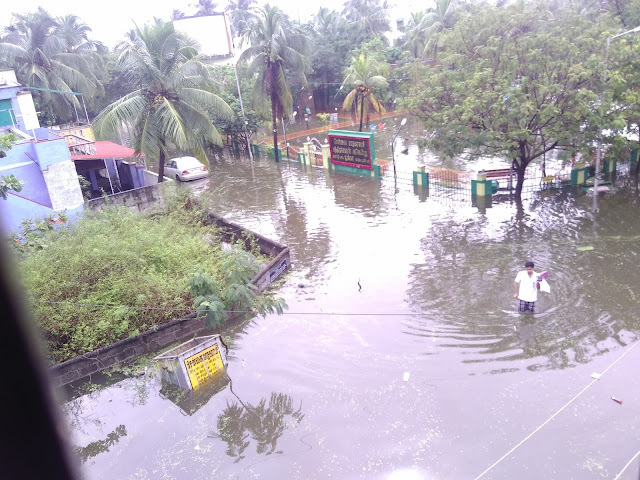 I went to main road (negotiating now waist deep water on street) and then to Tiruvanmiyur (a place 10 kms away) to check if any hotel rooms are available. Some autos and buses were operating. Visited Tidel Residency, City Residency, iWay(Perungudi), Gateway & Centre Point Sholinganallur etc. None of the hotels had single room free. At each hotel I could see a few families- mostly wife and children waiting in reception while husband is talking to reception staff or has gone out to check. Some patches of OMR were inundated, lots of office campuses flooded and river near Tangavelu college overflowing. I wanted to take pictures but I had to conserve my battery and also can't risk phone getting damaged with water, so didn't click pictures of situation I saw. Walked back to room, shared my findings with everyone, the water inside our house was now about half a feet or so. But we could walk around, cook some food (had gas, water, rice and some vegetables). Ate some stuff and slept for a while. December 2nd, 2015, Evening: By evening mobile Signal was gone. Walked out again in waist deep floodwater to main road and from there to Fortune Select Palms. Even they were sold out. But when I requested if I can charge my mobile a bit, reception staff agreed. So waited for about 30 mins, got some more charge into my phone, watched some news on TV there which said rain will continue for 3 days and came back home. Now it was getting dark and we had a decision to take- we didn't know if water level will increase overnight. If it increases by a few feet then we can't get to main road and will be completely cut off. So we had to decide if we want to stay inside the house (comfortable but risk of getting stranded) or outside (on the street or some shelters). Our owners family opted to spend the night in the car (that was parking at a higher area about half a km away), I took a decision to stay indoor and take my chances. Now it was dark, we had some more food and slept for the day. December 3rd 2015: Luckily the situation hadn't worsened. In fact water level had gone down by an inch or two. But there was still water in the house and lots of water in the street. Went on a walk for 2-3 kms, got some signal- couldn't call anyone but SMS was working, sent a few SMS to friends to update them and seek some actionable info. Few including Lakshmi Sharath responded but couldn't confirm if any mode of transportation out of city is working. I went out, got full tank petrol for my bike. Did a quick recce to find out if there is any way out of Chennai. Unfortunately each and every road was waterlogged at some point and hence not usable. There were lots of people on the street with bags trying to leave city. Nobody knew if buses were operating. ATMs had stopped working many places, people were desperately scrambling from one ATM to another hoping to withdraw money. I asked a police patrol- they said buses and trains are expected to begin from tomorrow evening (Dec 4th). Milk was no longer available, unless one is ready to pay Rs 50 to Rs 100 per packet. I bought 3kg rice that would be enough for a week. Walked around neighborhood to assess the situation- hundreds of people were on the street with bags trying to get out. In the evening again walked for about 4 kms and luckily got some signal and updated that we are safe.Water level begins to recede. Official rescue/relief teams didn't come to our area. It wasn't that necessary as we could walk to main road with some difficulty. When you have areas with waist deep water vs areas with neck deep water, area with neck deep water gets priority, so ours was not the biggest of problems city was facing.The rescue usually involves taking you out of your homes and dropping off at safe area. From there one has to figure out what to do next. Our life was never in danger. We had essential supplies to survive 3-4 days. But not having clear information was making decisions difficult- will it rain again and water level will increase again? Are they going to open any more reservoirs? Will everything be fine if we hold on for few more days? When will power be restored? No one knew for sure. So we had to take decisions with little or no information/certainty.I knew that resources will run out soon and it will be a much bigger mess if we run out of pure water or if fresh flooding happens. December 4th 2015: Water has receded now, no more water inside house, but it has left behind lots of filth. Sewage and fresh water is mixed up and lots of stinking smell. Streets still had about knee deep water. I thought of leaving for Bangalore on bike, but a flat tyre spoiled that plan. From the main road learnt that buses are operating from Koyambedu. Then dropped bike plan and decided to try bus. Packed a bag with bare minimum stuff, gave our remaining drinking water to owner family, locked house and left. Water had receded significantly. Came to Tidel park by bus (About 8.30 AM), took another bus to Broadway and then one more to Koyambedu (CMBT). From here I could catch a SETC bus heading to Hosur. (about 10.30AM). Reached Hosur by 4PM and from there took another bus to Bangalore. I could reach a relative's house in BLR by 6.30 PM. Informed everyone that we are safe. We could reach Bengaluru using government buses for less than Rs 250 (one third of what I usually spend on KSRTC Volvo). Some private operators were reportedly charging Rs 2000+ per seat. December 4th 2015, 9.45 PM: As I had to go to Goa for TataMotors/Indibloggers launch event of ZICA. It would have been easier to skip this event, but I would be missing a major opportunity to know more about the car. I had to give it a try reaching Goa on time. I booked myself on a seabird tourist bus to Goa from Bengaluru and reached Goa on 5th Dec 12 noon. It might take several days for things to get fixed and we can return to our home again- electricity should be restored, sewage water needs to be cleaned, freshwater sump needs to be cleaned and replenished, garbage and filth needs cleaned up, remaining water should drain/evaporate to be safe from waterborne diseases and so on. Since whole city needs these services, not sure when will they attend to our locality. Now looking back, we were fortunate to get out of Chennai safe and sound. Below are things that worked in our favor. 1. Our locality was relatively better. There are localities where entire ground floor is submerged and water entered first floor. 2. Thankfully we had near full charge, 2 emergency lamps with charge, adequate drinking water and food supplies when the crisis broke out. 4. Because water was only waist deep, we could walk to main road, find out what's happening, buy some stuff etc. If it had raised another feet or two, our situation would have been much worse. 5. Luckily no poisonous reptiles or insects bit me while I negotiated flooded streets. Else I might be in hospital or even dead. 6. Luckily our building had 2 floors and we got a place to shift upstairs as water entered our home. Without that it would have been lot worse. 7. Water logging inside house was only about half a feet or so. So we could walk around, cooks some food using gas or pickup other things. Another feet or two of flood could have spoiled lots of goods in the house. 8. Frequent information gathering by venturing out, battery conserved by switching off and few risks taken (like going to CMBT without 100% assurance of transportation from there) helped in our favor. 9. We didn't have any elders/people needing special attention/medication etc. Also I feel guilty I couldn't do much to help others. There are hundreds of volunteers on the road distributing food, sharing information, helping evacuation etc.God bless them. Also a good number of people vacating town will reduce pressure on the system- those left behind will get higher portion of essential supplies. Hats off to those volunteering and helping out affected people. At least for us the worst is over, but need to wait for normalcy to return. Let us pray for those still stuck and battling for essential stuffs. Oh, this was a tremendous torture from nature! Good to know the worst is over and now it is time to rebuild. Best wishes. Do let me know if I could be of any assistance. It was scary just reading it. Hope you people are able to settle down fast. This is really bad. Hope everything will be back to normal soon. Stay safe Shrinidhi and enjoy Goa. @Mridula-yes, safe n sound now. Had good time in Goa, will be returning to native place tomorrow. @indrani- Yes we will manage. @Deepak Sir: Thanks a lot. Good that you are safe.. My heart goes out to the victims of this natural disaster.. My younger sis also got stuck in Chennai floods and she is safe now..
Really scary to even read this. But glad you were able to get out of Chennai safe and sound. I have many relatives and friends stuck in Chennai but feel helpless as I could hardly contact them and be of any help to them. Hope life gets back to the normal state soon in Chennai. First a fall, well explained this crisis situation and I get a lot of schock reading this as a former Chennai vasi because Chennai never flooded... you did what you could do(: walked on waist deep water, brought stuff, was proactive...checked the neighbouring situation... also you left awesome way by bus when you had the chance(: ... applause.. I am sure things will become normal in a while... it is sad indeed to read this... but yeah... your other blog on how to deal in emergency crisis brought me here. You did well(: ... and you went to Goa too the same day you reached Bangalore... atta Girl, atta women!! ... I do agree we all felt guilty not helping too and must have been for you too... so a appuse for all those amazing volunteers man!! you all make us have hope and inspire us... next time let's be even more proactive and help others, or atleast you be!! ... its the next step... only you need a boat to go distribute those food packets... but still very proud of your proactiveness(: ... I will come back to see how your home is restored to normalcy soon!! and let's have a analysys on why this flood happened... is it because there was city urban construction near the rivers?... I read news that for Telelangana, they decided to have capital City on Amrvati but since its near river Krishna and bedrock has water, they feel that area one must grow trees not Cities...otherwise the area will be flooded... man it really is depressing that namma Chennai get drowned this way... I don't like the City but I guess I have to say its beautiful City in it's own way(: atleast for the South Indians we always love Madras for the Southern flavour!! Dear Shrinidhi: What an ordeal and must salute your courage to go out in waist deep water many time. Did not realized you have gone through so much when we met in Goa. Reading things in newspaper and TV is one thing, seeing somebody you know personally suffer is totally different. ...So glad you and your family are safe. always stay safe dear friend..
@Prasad- well what we suffered is nothing compared to what many others are going through. We were relatively better off. Newspapers and TV usually show worst case scenarios- not every area is affected as bad as those visuals. @Sneh- good to know your family members are safe. city is returning to normalcy now, but still lots of work pending like clearing garbage etc. Some fresh rain alerts are also likely to delay this process. Let us hope for the best. @Arun- try contacting them now. I read that electricity and mobile network is restored in many areas- you should be able to reach them. Else take help from some volunteers on the ground. Thanks Amanda for detailed comments and kind words. Yes, we will bounce back in no time. It requires tremendous courage to face an eventuality of this scale and glad that Chennaites showed true grit and determination and more importantly the will to help each other despite their own adversities! Good to hear that you are safe and sound :) Heard lot of people with family were moved to Bangalore as part of BCP .. Happy to know that you are safe.Take Care. I hope all people are safe in Chennai. God bless them. This is very tough time for Chennai. Oh man! It was indeed big. Thankfully it did not get any worse for you. So good that you made it out of the city safely. Yes Rajiv. It was a lifetime experience. While I made it out safely, my feelings were with those who stayed behind to volunteer and those who were stuck and couldn't get to safety. This was a really unbearable pain given by natural disaster at that time we were not able to sleep at our own home for 4 days real a bad torture by the climate.